You can see thee vector here. I change the bg to be the one u see right now...and with that I change the colors of syaoran and sakura vector too. and for the blurred parts i did it purposely. Such soft vectoring! 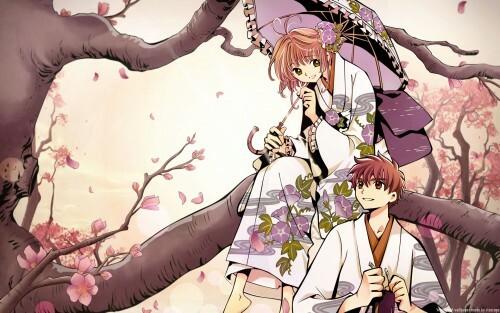 Take a look at how Rizacaga did the shading on the tree branches and flowers. Very neat and very pretty! Proposed by gaara-no-shukaku and highlighted by Chloe. Oh my gosh Riza your the bestest..*runs and tackles you in a hug*. 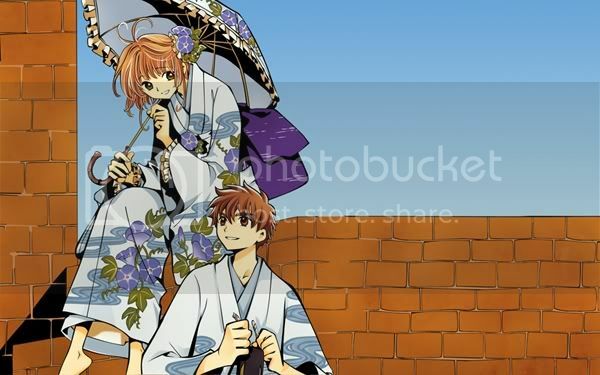 I just love this I love your vector works and how you did sakura and syaoran is amazing and I love how you did the tree and the blossoms they look so realistic I was like O.O. And the background looks so awesome with them it fits them. I really love how you did their hair and eyes and how you shaded them. I cant stop staring their adorable I love this couple. Thank you so much *hugs*. This is the best because you know how much I love your walls and now I got something new to stare at on my computer XD. Lovely job! Love the vector, but I think the background look too... painted? It doesn't look well with the character that was vectored. wow, really beautiful, love the colors. I think this is you best wall yet! The vector looks nice and sharp and the background fits them very nicely! The vector is really pretty but instead of sakura flowers I'd rather see the ones Sakura has on her kimono (don't know the name). forget to blur some petals as well...gives a great sense of the depth in the wall. to the rest of the gradient, maybe a more intense orange or just saturating it more will give it more warmth and balance. in a great effort to vectoring the scan. Great job Riza. Neat vectoring and lovely coloring. The subtle blurring works perfectly. I love how everything has this pink vibe, it makes everything fit. wow this is very wonderful. you really did well with the blur of some areas like the branches and the cherry blossoms also to give such a nice soft touch onto the wallpaper. Love the adjustment of the colors you did on this, I can agree with gaara so much about this and definitely deserves a highlight. I like that the lighting is consistent, the sunset feeling is well portrayed by the rosy tones on everything. The colors are lovely, and you did an amazing job on those trees! The vector work is really clean but still soft. Just beautiful.